Describing Eddie Huang’s memoir, Fresh Off the Boat (2013), with the adjectives “culinary” or “foodie” would be to needlessly limit the scope of a text that seeks to speak for a generation of young adults of color who grew up listening to gangsta rap, and for whom pumped up kicks and street wear represent the height of fashion. Placing too much importance on the fact that this book grew out of Mr. Huang’s eponymous blog would likewise be ill advised, especially since such a comparison would have the unfortunate, but inevitable, result of implying that this raw, and urgent memoir has anything in common with Julie & Julia: 365 Days, 524 Recipes,1 Tiny Apartment Kitchen (2005), the formulaic blog-to-book product that inspired the charming movie adaptation, Julie & Julia (2009), penned by Nora Ephron. Nothing could be further from the truth. Huang is a proud heir of Anthony Bourdain’s brand of bad-boy-chef school of writing (which also includes the testosterone-fueled tone of most contributions to the food magazine Lucky Peach, published by David Chang, the Korean American chef and leader of the Momofuku restaurant empire, whom Huang sees as something of a nemesis). Whereas Chang and his literary ilk devote the majority of their waking hours to thoughts of food—how best to cook, eat, butcher, forage, prepare, and experiment with it–Eddie Huang is at pains to explain that his restaurant, Baohaus, is not the defining achievement of his life but, rather, represents one of his many driving passions. This becomes most obvious when, towards the end of the book, he declares in no uncertain terms that the topic that impels him to write is not his love of good food but, rather, something closer to home: race. This revelation appears in the closing chapter of the memoir, but it should come as no surprise to attentive readers, who will have noticed plenty of foreshadowing scattered throughout the preceding chapters. I read Huang’s choice to maintain the placement of this epiphany at the end of the memoir, where it fits in chronologically, rather than editing the entire manuscript so that it gains more cohesion as a treatise on the lived experiences of racialized subjects in America, as a reflection of his commitment to use a prose style that rings true to his peers. This quest for an authentic voice is yet another constant throughout the memoir. It belies Huang’s self-professed appreciation of canonical literary and philosophical texts such as Jonathan Swift’s satire, A Modest Proposal (1726) which, coincidentally, proposes cannibalism of children as a tongue-in-cheek solution to alleviating poverty in Ireland; his understanding of Hamlet and other Shakespearean drama; and his solidarity with W.E. B. Du Bois and Toni Morrison as fellow writers of color. Although Eddie Huang’s memoir aspires to an urban, rather than academic readership, he does give props to influential professors who took him to task for getting by on the substance, rather than the style, of his writing. This book, therefore, reflects a conscious literary aesthetic that effectively conveys his anger, frustration, and, finally, the pride he finally takes on growing up as a Chinese American “rotten banana” in Orlando, and coming of age in New York. Thus, the title of this blog entry, which refers to the process of parboiling a piece of meat in order to remove any trace of what Mr. Huang calls alternatively its “funkiness” or its “stink”. Huang first mentions this cooking technique when discussing his introduction to cooking at the hands of the Haitian cooks who worked at his father’s steakhouse restaurant in Orlando, Cattleman’s. He first acknowledges that he learned how to cook ribs from the (unnamed) Haitian cooks, then defines the cooking technique for his non-foodie readers in a footnote, citing it as proof of a shared set of assumptions or values across overlapping, but distinct, diasporas (Asian and African), before finally disavowing it altogether as “the wrong way” or “knowing there was something off, and then learning to do it the right way” (142). Huang cites this particular insight as his first significant culinary epiphany. Long story short, Eddie comes up with his own twist to Mao’s favorite dish and, while not winning the “showdown,” he does find a career path as a restaurant owner that not only aligns him with his heritage—as the son of a restaurateur—but perhaps most importantly, it allows him to hire like-minded people who enjoy Taiwanese street food (baos) but do not necessarily want to work in the restaurant business forever. The traumatic events preceding this professional epiphany— whether it was fighting over racial slurs, selling drugs, being thrown in jail, or hustling to keep his streetwear company afloat —constitute Eddie Huang’s own version of “cooking off” or “throwing out” his very own “first,” the anger and frustration he grew up with as an Asian American kid in the South. While the events chronicled in Fresh Off the Boat may best be understood through this culinary metaphor, Eddie’s final realization that his personal calling is to start a national and frank conversation on contemporary race relations in an America that is most definitely not post-racial takes us all beyond the kitchen, and into the public arena of civics. Whether this gamble pays off by sparking a new national dialogue that goes beyond the use of empty slogans like “diversity” and gets to the heart of the matter in figuring out how to foster mutual understanding and appreciation of the cultural richness that people who are still “fresh off the boat” continue to impart upon us all, remains to be seen. In what is arguably the best known expatriate culinary memoir of the twentieth century, The Alice B. Toklas Cookbook (1954), Gertrude Stein’s widow offers a “mingling of recipe and reminiscence” for American readers to emulate. The California-raised daughter of Polish immigrants, Alice B. Toklas traveled to France after the San Francisco earthquake in 1907. Once she met and fell in love with Gertrude Stein, Toklas decided to make France her home permanently. The two women parlayed their romantic and professional partnership into a carefully crafted joint public persona as a couple, a phenomenon that has recently become more mainstream through the popular or celebrity media practice of blending the first names of partners involved in high profile or celebrity “supercouples” to arrive at a portmanteau word which serves as a joint moniker, such as Bennifer, TomKat, or Brangelina. While such naming conventions were not in vogue when either Stein or Toklas was writing, I argue that they nonetheless pioneered the concept of the supercouple by constantly referring to their status as domestic partners in public and private life, and using the first person plural “we” and “our” more often than the first person singular in their correspondence and published writing. Interestingly, being a “cook” is not among the multiple occupations at which the narrative voice of Alice B. Toklas claims to be “pretty good”. This silence regarding her skills in the kitchen seems all the more striking for all the attention paid to the meals the couple consumes and feeds to their famous friends, both at their Saturday night salons in Paris, as well as in their summer place in Provence. Since Alice B. Toklas’ refined palate was legendary in its sophistication even at this early date, and especially given that gastronomy is an ongoing theme throughout the Autobiography, this omission is rather comical. Sandra Gilbert and Susan Gubar read this mouthwatering scenario as Anderson’s sexist reaffirmation of traditional gender roles, not only because he situates Stein, who does not cook, in an imaginary kitchen but also, presumably, because he explicitly compares her approach to writing to the manual labor of both hired cooks and of the unacknowledged Alice. I prefer to read this passage as an example of how successful these women were in promoting a joint public persona. This passage may be just another instance of what Gilbert and Gubar call Stein’s “lesbian doubletalk” which they claim she developed in the poem, “Lifting Belly,” where Stein deploys the couple’s collective voice to “re-enact yet ridicule the hierarchies that structure the heterosexual marriage even as they release imaginative energies” (No Man’s Land 188). However, in the passage I examine, Stein’s imaginative energy goes so far as to portray Alice as an independent, self-determining, desiring agent who not only “decided” to undertake such a project but also denies her lover the authority to act as literary ventriloquist a second time, “with reason”. The source of such confidence is not the stranger’s prognostication but, I would argue, the self-same culinary expertise to which the “narrative voice” of the Alice B. Toklas from the Autobiography lays claim. In any event, time is the ever-present foe which thwarts the writerly ambition of both Stein’s 1933 and 1937 literary projections of Alice B. Toklas; it is not until Gertrude Stein’s death in 1946, that the historical Alice B. Toklas takes steps to fulfill this joint ambition of having a career writing cookbooks. When she does take it upon herself to put pen to paper and recreate the meals she and her beloved shared in France for the enjoyment and pleasure of her American (and British) reading audiences, Toklas contradicts the easy and confident tone which Stein ascribed to her fictional narrative voice early in the Autobiography. Stein’s version of Toklas takes ownership of her personal expertise in the kitchen; to her presumably lay readers, Stein’s Toklas defends her use of the culinary allusions to explain her understanding of how artists conduct their work: “I do inevitably take my comparisons from the kitchen because I like food and cooking and know something about it” (no page numbers, Kindle version!) Ironically, the historical Toklas herself addresses her American and British readers more complexly, simultaneously leveling the playing field by declaring herself an expert in the kitchen who is addressing an imagined community of peers “As cook to cook” (xi), while also confessing that her ascendance to that role coincided with her relationship with Gertrude Stein: “Before coming to Paris I was interested in food but not in doing any cooking. When in 1908 I went to live with Gertrude Stein at the rue the Fleurus she said we would have American food for Sunday-evening supper, she had enough French and Italian cooking; the servant would be out and I should have the kitchen to myself” (29). Toklas ascribes the rise of her interest in domestic matters to a double displacement occasioned by love: through her involvement with a beloved who is employed abroad (Gertrude Stein), she becomes separated from the United States, her country of origin, and cast adrift from her own identity as a professional except in relation to the beloved. Cooking or the task of overseeing the preparation of meals, thus, become acceptable ways through which Toklas and the women who follow in her footsteps perform their identity as “Americans” for and with their beloved. 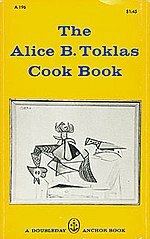 Alice B. Toklas’ self-titled Cookbook displays a wealth of hard-earned, accumulated culinary knowledge, most of it hers, but not exclusively so but also serves as a work of mourning: it pays tribute to the long and happy union that was the inspiration for Toklas to finally fulfill the writerly aspiration her beloved envisioned for her.